The sound gives it away — a distinct, whirring and metallic noise as a dozen steel rollers spin across a thick cable. 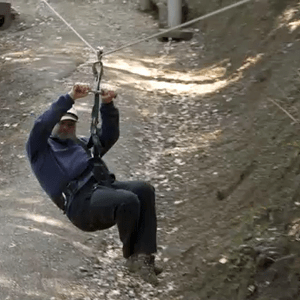 Rogue Valley ZipLine Adventure is a high-wire act that lets you soar over treetops and leave all your troubles behind. 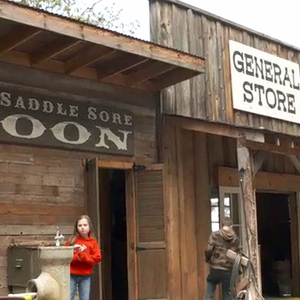 Before soaring in the sky, riders first gear up for safety. Zip line guides Steve Carlino and Katie Fawkes show the ropes of handling a harness and helmet before leading participants up a short trail to Zipline #1. 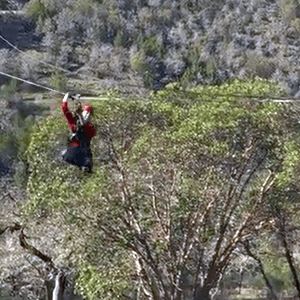 It’s hard not have a blast when you ride across 2,700 feet of high-wire zip lines through scrub oak and pine trees in the arid climate of Jackson County, just outside Gold Hill. Each of the lines — which are numbered 1-5 and get progressively longer and higher — allow the zippers to gain more and more confidence.